How do judges judge? Do they apply law to facts in a mechanical and deliberative way, as the formalists suggest they do, or do they rely on hunches and gut feelings, as the realists maintain? Debate has raged for decades, but researchers have offered little hard evidence in support of either model. 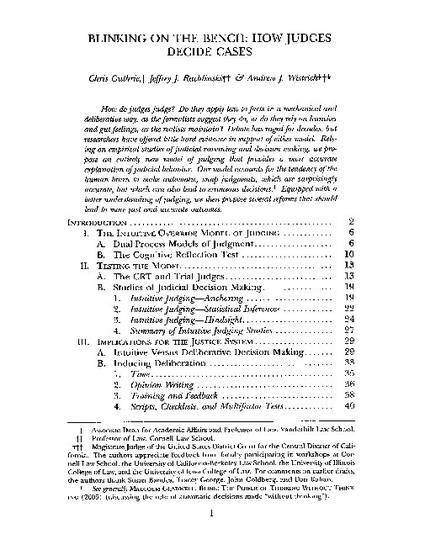 Relying on empirical studies of judicial reasoning and decision making, we propose an entirely new model of judging that provides a more accurate explanation of judicial behavior. Our model accounts for the tendency of the human brain to make automatic, snap judgments, which are surprisingly accurate, but which can also lead to erroneous decisions. Equipped with a better understanding of judging, we then propose several reforms that should lead to more just and accurate outcomes.